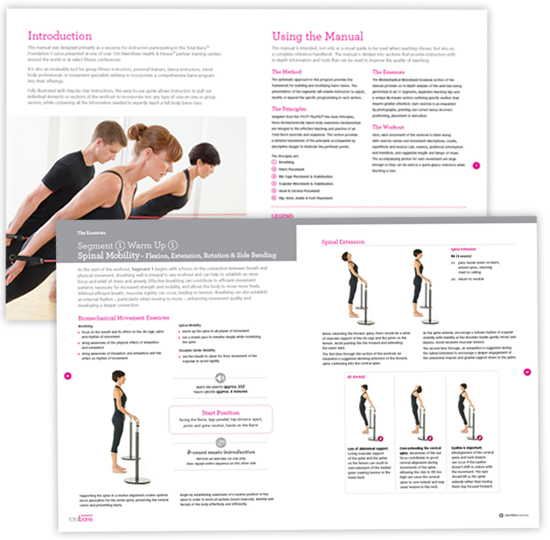 Teach highly evolved barre classes in any setting. Learn choreography, exercise essence and correct biomechanics of movement, as well as how to effectively utilize the power of music to create safe and fun barre classes that focus on increasing strength, flexibility, stamina and dynamic stability. It truly is a program geared for everyone—no dance experience or tutus are required! The Total Barre™ Foundation Course provides the groundwork for Instructors, enabling them to produce safe, effective and varied programs that address the needs and goals of every client. The Course presents 11 specially arranged and selected segments – accompanied by timed selections of music – that serve as the template for each session or class and produce a balanced and complete workout. Participants are also introduced to the Total Barre Principles. Designed to support the groundwork learned through the Foundations Course, a series of specially programmed workshops are available. These sessions focus on exercise progressions, movement form and efficiency, and the importance of cueing with music for movement quality. Workshops provide instructors with pre-programmed workouts specifically designed to address a specific aspect of training or to suit a particular target group. Additional concepts are explored— including the value of cardio-based intervals within a program, suggestions on themes and programs geared toward specific fitness goals. 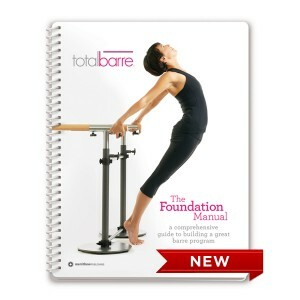 Total Barre Foundation Manual included in your tuition. Detailed instruction and full-color images.